This recipe legit took me 15 minutes – so stop complaining you dont have enough time to eat paleo. To make this I dropped some Coconut oil on a medium frying pan on medium heat. I tossed on the diced garlic clove and once I could start smelling it, I threw the meat on top. I added some spices (garlic powder, onion powder, salt, pepper, chipotle spice & parsley). I mixed it well and let that cook on low-medium. While that was “browning” I took out of my spiralizer and used the blade that makes ribbons and made zucchini ribbons! By the time I was done with that the meat was about 1/2 way there. I dumped in the can of diced tomatoes and mixed that up. About 5 min more minutes in and the meat was lookin’ good. I added in the zucchini and cooked for about 3 minutes ( I like the “noodles” to still be crunchy). I put it on my fancy paper plate and ate it. Legit 15 minutes maximum – NO LIE. 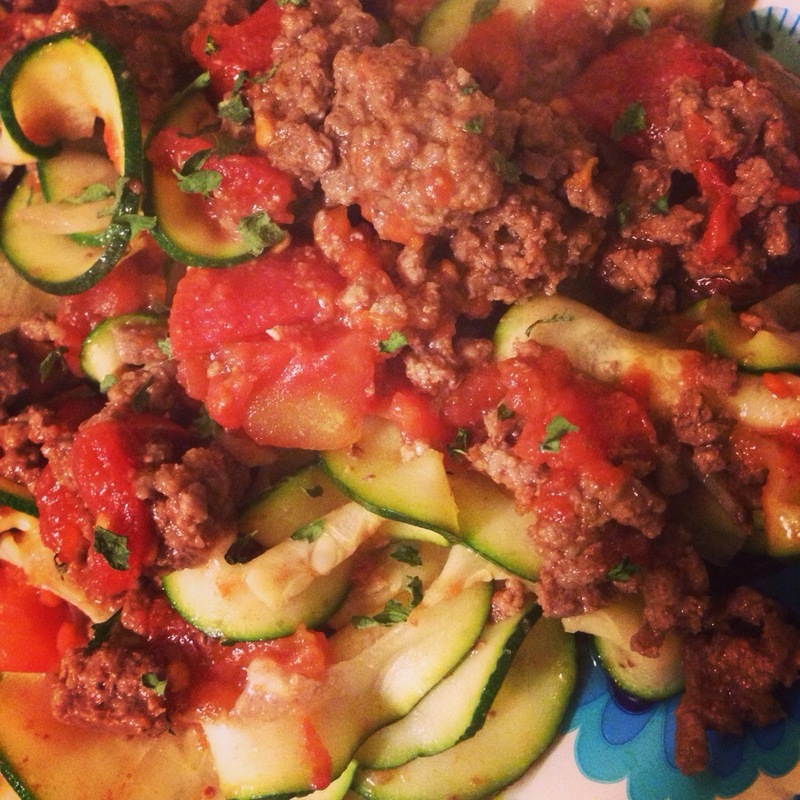 This entry was posted in Dinner, Lunch and tagged dinner, meat, noodles, paleo, spiralizer, tomatoes, zucchini. Bookmark the permalink.